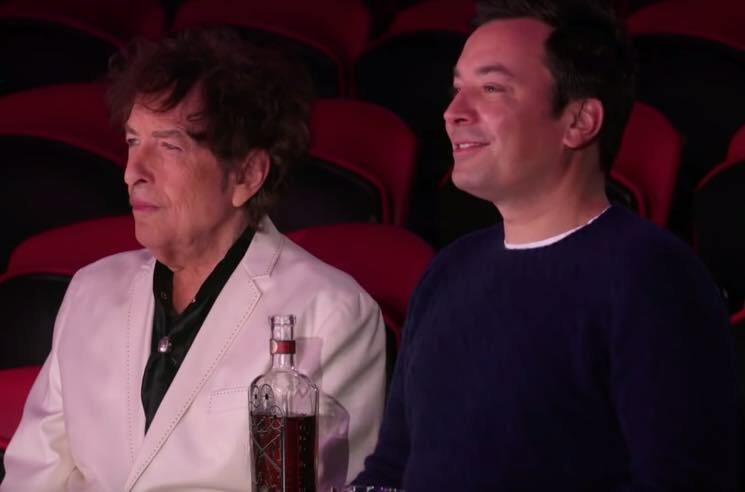 Bob Dylan rarely makes television appearances these days, but he made an exception to hock his new Heaven's Door brand of whiskey on The Tonight Show Starring Jimmy Fallon last night (November 22). The segment sees Dylan and Fallon alone in a theatre, watching a circus performance and silently sipping whiskey. Fallon definitely seems more amused by the aerial and acrobatic marvels before them than Dylan does. In fact, he doesn't even stick around until the end of the show. Watch the bizarre whiskey spot below.